Bushwalk Tasmania recommends the following sites to assist with booking accommodation in Tasmania. One of Tasmania's most recognisable landmarks is Cradle Mountain, at the northern end of the famous Overland Track linking Cradle Valley to Lake St Clair which is a 5-6 day walk south. It has a visitor centre with its interpretive display, ranger station, park information, walker registration and regularly updated weather reports. Weather can change quickly so always be prepared for all conditions. There are many excellent short walks from the centre and the Dove Lake car park, 14 km further away. You'll find a range of Tasmania accommodation in the Cradle Valley area, including the luxury Cradle Mountain wilderness lodge. Launceston is Tassie's second largest city, located on the banks of the Tamar River in the north of the state.The city centre is a short walk from the scenic Cataract Gorge Reserve, with its tree rhododendrons and peacocks, fern glades, swimming pool, chairlift and and lawns. Fine food is a feature of Launceston's growing reputation for food and culture with the city having manay excellent eateries and restaurants. The Tasman Peninsula, Port Arthur and Eaglehawk Neck offer diverse day walking options. 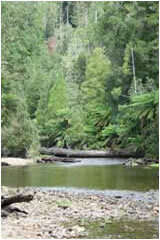 Choose from over 30 fantastic walks in and around Tasman National Park. From 15 min easy family walks right up to challenging walks for the more experienced and adventurous. Hobart is the capital city of Tasmania. It is home to sandstone, dockside fishmongers, al fresco coffee shops, art and craft, culture, sport and theatre. Hobart is located on the Derwent River; take a river cruise, or drive to the summit of Mount Wellington. Take a 25 minute drive to the historic town of Richmond, with its fine Georgian architecture, galleries and boutiques.